REP1061 (Collector Werner Reppenhagen) Locality: Zaragoza de Solis, San Luis PotosÃ­, Mexico, 1950 m asl. Origin and Habitat: Central Mexico (states of Hidalgo, Guerrero, Mexico, Aguascalientes, Zacatecas, Queretaro, Guanajuato, Tapaulimas, Nuevo Leon and San Luis Potosi). Altitude range: 1300-2500 metres above sea level. 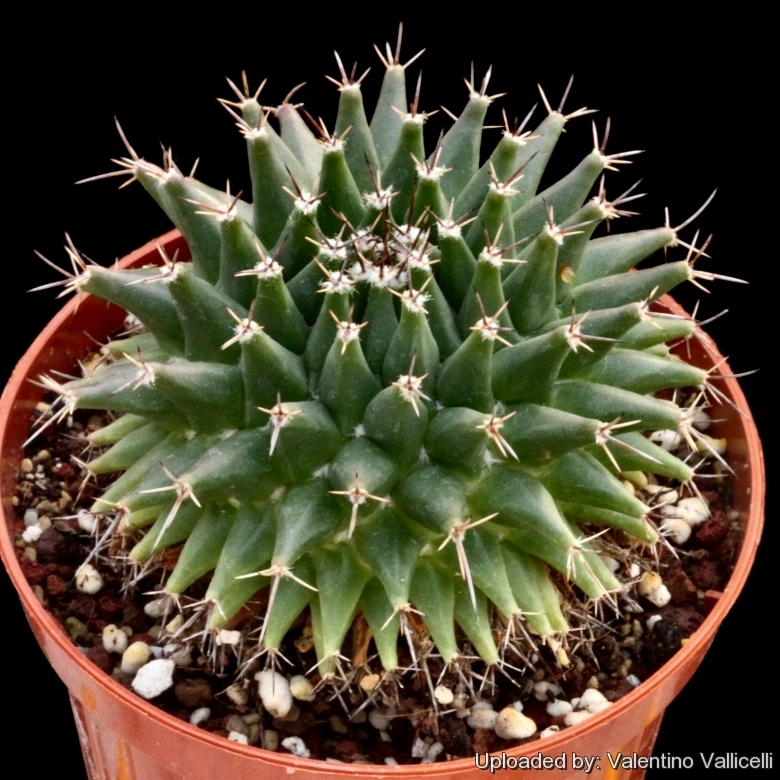 Habitat and ecology: Accompanying cactus and succulent species can be Ferocactus latispinus, Myrtillocactus geometrizans, Echinocactus platyacanthus, Ferocactus histrix, Echinocereus pectinatus, Opuntia microdasys, Thelocactus hexaedrophorus, Stenocereus dumortieri, Coryphantha radians, Neolloydia conoidea, Glandulicactus crassihamtaus, Thelocactus bicolor, Agave lechuguilla and Yucca filifera. Description: Mammillaria vagaspina is a low growing globular plant at first solitary, later branching basally (or dichotomously) to form large mounds up to 50 cm in diameter (or more) barely rising above ground level. It has distinguishing long angular tubercles set with short stiff radial spines and curving long straw-white central spines. It will reward the skilled growers with ring of light pink flowers circling the crown of the plant. Mammillaria vagaspina is at most a race of Mammillaria magnimamma. The key difference by which the two were separated, namely the presence of central spines in M. vagaspina, seems entirely spurious, but plants from the central plateau region do differ in various respects from that on the stony ground of Mexico City. Stems: Simple (or clustering), globose to pumpkin-shaped, 8.5-12 cm in diameter green or greyish blue., with dense white wool especially when young. Axils toward apex filled with white wool. Tubercles: Pyramidal, more or less four angled and keeled, up to 13 mm long (or longer), 8-11 mm thick at base, dull dark greyish green. Axils toward apex filled with white wool. Central spines: 2, very irregular, 6-60mm long, divergent, lower longer, very tortuous, somewhat angled, chalky brown to yellowish with dark tips. Radial spines: 2-5, extremely variable, uneven, 1-10 mm long, acicular, the upper 2 usually deciduous, chalky brownish white, lower one directed downward and longer. Flowers: c.10 mm in diameter, pink. Fruits (berries): Curved clavate, 11 mm long, 4 mm in diameter, red. Mammillaria magnimamma Haw. : Has blue-green body, dirty cream to reddish flower, and no central spines. It is very variable. Distribution: Hidalgo, Guerrero, Mexico, Aguascalientes, Zacatecas, Queretaro, Guanajuato, Tamaulipas, Nuevo Leon, and San Luis Potosi. Mammillaria saxicola Repp. : has olive green body, whitish flower, more radial spines and the presence of central spines. Distribution: Queretaro and the border of San Luis Potosi, near Arroyo Seco. Mammillaria vagaspina R.T.Craig: has long twisted central spines. Distribution: Central Mexico. Mammillaria vallensis Repp. : Distribution: Abra Valles, San Luis Potosí. Mammillaria vallensis var. brevispina Repp. : Distribution: Abra Celaya, Antiguo Morelos to Ciudad Mante, Tamaulipas. Cultivation and Propagation: Mammillaria vagaspina is easy to cultivate, and makes an interesting specimens. Over time it will produce large clumps. It grows by producing offsets, and also by dichotomously dividing and doesn't require any special treatment, but needs as much light as possible without burning the plant, to keep the stems compact. During the summer it is best to keep the plants outside where the temperature can rise to over 30° C with no harm to the plant, recommended for any collection that needs lots of light with ample airflow. Growth rate: It is a small growing, but easily flowering species. It takes several years to offset, but once it starts it can fill a 40 cm pot in a few years given the best conditions. Repotting: Repotting every 2-3 years. As it is especially prone to rot under-pot in a smaller container filled with very porous compost. Use shallow pot with good drainage. Watering: It likes a winter's rest and should be kept almost completely dry during the winter months, If the soil is allowed to be dry for too long root loss could follow but equally the same result would occur if the plants are both wet and cold. From March onwards the plant will begin to grow and watering should be increased gradually until late May when the plant should be in full growth. Water regularly during the summer so long as the plant pot is allowed to drain and not sit in a tray of water. During hot weather you may need to water the plants more frequently so long as the plant is actively growing. From late September watering should be reduced to force the plant to go in to a state of semi dormancy, by October you should be back in to the winter watering regime. Keep dry with ample airflow in winter. In the rest period no high atmospheric humidity!! Care must be taken with watering as they tends to become swollen and untidy in growth habit if given too much water and shade. Fertilization: Feeding may not be necessary at all if the compost is fresh then, feed in summer only if the plant hasn't been repotted recently. Do not feed the plants from September onwards as this can cause lush growth which can be fatal during the darker cold months. .
Hardiness: Grown specimens resist to -4°C for a short time, but it is best to keep above 5° C to avoid ugly spots on the plant epidermis. Some warmth throughout the year will increase the grower's success. Exposition: Need full sun avoiding only the harshest summer sun, if kept too dark they may become overly lush and greener and could be prone to rotting due to over watering. Tends to bronze in strong light, which encourages flowering and heavy wool and spine production. Uses: It is an excellent plant for container growing. It look fine in a cold greenhouse and frame. Propagation: Direct sow after last frost or cuttings. Seeds germinate in 7-14 days at 21-27° C in spring, remove the glass cover gradually as the plants develops and keep ventilated, no full sun for young plants! The seedlings should not be disturbed until they are well rooted, after which they can be planted separately in small pots. Cuttings: wait until the offsets that appear at the base of old clustered specimens are 1/3 the size of the parent and then detach and plant. Cuttings will take root in a minimum temperature of 20° C (but better in hot weather). Cuttings of healthy shoots can be taken in the spring and summer. Cut the stem with a sharp, sterile knife, leave the cutting in a warm, dry place for a week or weeks (depending on how thick the cutting is) until a callus forms over the wound. Once the callus forms, the cutting may be inserted in a container filled with firmed cactus potting mix topped with a surface layer of coarse grit. They should be placed in the coarse grit only; this prevents the cut end from becoming too wet and allows the roots to penetrate the rich compost underneath. The cuttings should root in 2 to 6 weeks.